Note: ByteStat has been superceded by JByteStat, which is a port to Java of this utility. This page remains available for reference, but it is recommended to use JByteStat instead. ByteStat is a simple byte histogram utility. 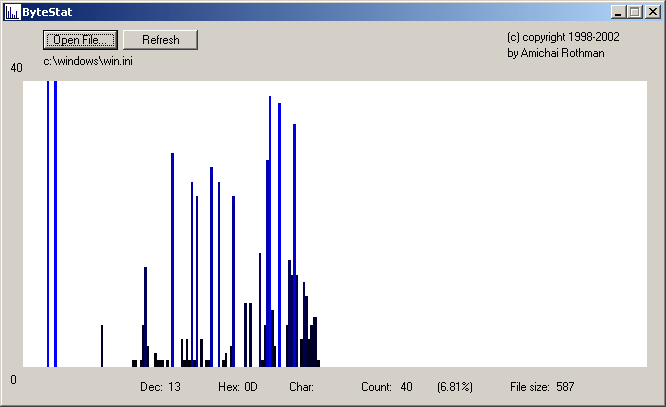 It lets you visually see the byte histogram - how many times each byte value (0-255) appears in a file. To install ByteStat, Double-Click the setup file. This will start a Setup Wizard that will guide you through the simple installation process. To uninstall ByteStat, select Uninstall from the ByteStat Start Menu group, if you selected this option during installation, or run Uninstall from the installation folder. Please write in with any bugs, suggestions, fixes, contributions, or just to drop a good word and let me know you've found ByteStat useful and you'd like it to keep being maintained.